During 2015 I tracked the betting odds on all league and Championship games. Or at least I thought I did. The plan was to do a piece comparing all teams’ expected wins versus how they did and see who outperformed their odds throughout the year. Or underperformed. I had completely forgotten that people get blog entries through email. It wasn’t until my brother texted me to tell me that he never visits the blog (thanks bro!) and gets everything through email that I remembered there was an email list. Why this is important is that I have gotten into a bad habit of putting entries up quickly and then fixing them on the fly – but the first, usually incorrect, entry goes by mail. Apologies for that – I’ll try and take an extra hour or two and get the first entry right. I have updated (finally) the definitions page (here). Feel free to rummage and find any errors/omissions. One of the issues with this being a hobby is that real life gets in the way. I am going to be out of the country over the coming week so won’t get to this weekend’s games except on a delayed basis. There are three huge games in the Provincial finals. 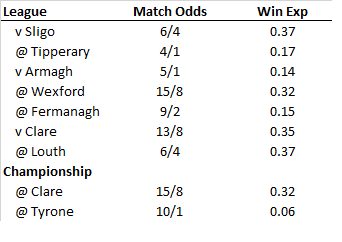 Given the history we have to date it is likely I will do the Cork – Kerry game first and then choose between Mayo – Sligo and Donegal – Monaghan depending on how the games go. Though keep an eye on the Ulster GAA website as they have an excellent (and much cleaner looking!) breakdown of all their games. Donegal – Monaghan should be out mid-week. I don’t mind people using the stats. I don’t. Anyone who has interacted with me will tell you that – people don’t have to ask to be honest. Just credit the original source as it does take some time to collate. Generally what I do is not proprietary. It is basically glorified counting and segmentation (apart from the weighting) thus anyone could do it. And that’s the problem. There have been a few instances where you *know* the data has been lifted from the blog and I look like an attention seeking teenager looking for notice when you query where the numbers have come from. Then there are times when the person has obviously gone through the game and come to the same numbers/conclusions. It can become tiresome (a) trying to decipher who has lifted the numbers and (b) seeing yourself as an attention seeking teenager. Tis many, many years since I was that!! If you want to use any of the data go ahead. Just credit the source – please! One of the new metrics introduced during the 2014 Championship was the tracking of where attacks originated. It was not captured in the expectation of finding something but rather an exploratory piece just to gain some more insight into how a game flows. It is important to state that what this does not do is track how effective teams are with the ball. It is more a measure of whether a team’s ability to defend an attack is dependent on where the attack originates. Own, Mid & Opp all relate to gaining the ball from turnovers in a specific area of the pitch. Other includes gaining the ball from retrieving your own team’s wayward shot, throw ins etc. 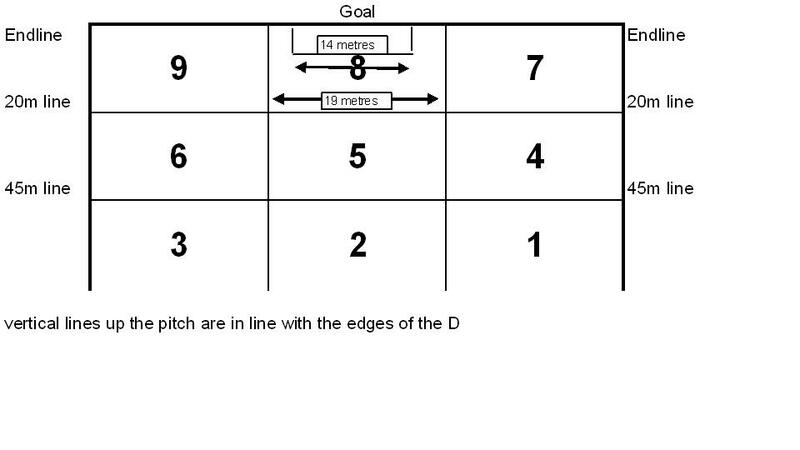 Own 3rd = inside your 45, Opp 3rd = inside the opposition’s 45 whilst Mid 3rd is the area in between the two 45s. A couple of things immediately pop out. Just under half of all attacks originate from kickouts with 31% coming from your own kickout. Kickouts are one of the few set plays within the game and an ability for a team to direct how primary possession is to be delivered. It is of course essential that teams win this primary possession – but they must also have a plan for what happens next. Too often the focus is on who “won” possession rather than what teams did with that possession. The vast majority of turnovers that turn into an attack originate inside your own 45. This is in no way surprising as that is where the majority of attacks are engaged – it also includes all those shots that drop short – but it still shows the value of your transition game. The general homogenous nature of the shot rate (apart from when you turn over the ball inside the opposition’s 45) is a surprise. I would have expected that balls turned over in the middle 3rd would have caught the defending team in less of a defensive set and thus made getting a shot off easier. This does not appear to be the case and is further confused by the fact that the shots that are taken are of a much poorer nature with only 45% converted. Could it be that after winning the ball rather than drive at the opposition the first thought is to secure the hard won possession and thus allow the defence to stream back? This would account for the similar shot rates but not necessarily the poorer score rate. The shot rate for balls won from either your own or the opposition’s kickout is very similar. This in a way feeds into the strange homogenous nature of the shot rates. At a macro level you are going to gain possession from the opposition’s kickout further up the pitch than your own – plus if you win the opposition’s kickout they are more likely not to be in their full defensive set (anticipating winning their own kickout themselves). The fact that more shots are not eeked out from winning the opposition’s kickout is again slightly surprising. Teams score 4% more of the time from shots that originate from the opposition’s kickout. Whilst an increase of 4% might be within any margin of error it does make sense in the aforementioned context of the defence not being as set on their own kickouts. As ever on these pieces Donegal are the outlier. As a result of not engaging outside their own 45 only 6% of their attacks originated from turnovers further up the pitch. This compares with an average of 13% with returns of 15% (Kerry), 21% (Mayo) and 18% (Dublin) for the other semi-finalists. It is this, attacking the opposition’s kickout and getting opportunities from same, that might be one of the key strengths of the “better” teams. The new weighting, taking into account the returns from the past three years, has been applied to the 74 Championship games in the database. Below are some comparisons of teams/players/games over that period. Ross Munnelly’s game against Dublin stands out not only for its quality but also for the fact that he did it on a team that eventually lost by 11 points. He was immense that day. We’ll touch on O’Donoghue anon. Given that O’Donoghue has two of the top five one off performances it should be no surprise to see him sitting comfortably atop the overall table. Part of why he is so far ahead of everyone is the fact that he has only returned one game with a negative weighting – this year’s All Ireland final when he missed his one shot. O’Donoghue is running at a remarkable 73% conversion rate – as was Cooper throughout ‘12 & ‘13. Scary thought for those trying to topple Kerry what with the imminent return of Tommy Walsh as well. Flynn’s weighting is huge on such a low Success Rate. This is due to where he shoots from; he has had 41 point attempts charted and only two were from inside the 20m line. Sectors 4 & 5 are his playground; he has a Success Rate of 69% on these (20 from 29). Re Dublin it shows at times how easy the mopping up duty has been for them. D Rock, who mainly has had cameo roles coming off the bench, is 7th on the overall list converting 80% (20 from 25) of his shots for a weighting of +5.196. O’Connor’s accuracy, over so many shots is noteworthy. Only B Brogan & C McFadden are credited, alongside O’Connor, with more than 100 shots. Unsurprisingly three of the top5 overall games reappear. *If* we had adjustments based on the defence you faced then I’m sure Keating’s performance against the Donegal wall in 2012 would come out on top. He was genuinely remarkable that day hitting 5/6 with four of his five scores coming from outside the 20m line. He had one free from the right hand side out in Sector6 – had he converted that it would have been the 2nd highest scoring performance ever behind O’Neill. Stephen Cluxton has converted 75% of his 45s (21 from 28). The Rest of Ireland combined is running at 39% rate (38 from 97). That difference is phenomenal. Cluxton’s 28 attempts make up 22% of all 45s recorded – I can’t imagine any other player has such an impact on any other slicing of the database. I’m obviously showing the Top6 just to get three Cluxton games in! I guess it is no surprise to see Cluxton up there so often given his prowess from 45s though it is worth noting that he is only converting at 43% (9 from 21) for free kicks. Cavanagh hit a rich vein of form in 2013 from frees. He was 3 from 3 against Kildare in Newbridge then hit 6 from 6 (all from Sector 6!) in Croke Park in the next game against Meath. No forwards how are ya! Mayo occupy three of the top five positions with the standout being their 2013 QF demolition of Donegal. Sooo – hands up who had an Ulster QF down as being one of the Top5 most accurate games? Didn’t think so! The remarkable thing about Mayo’s annihilation of Donegal in 2013 was that shooting wise Donegal didn’t capitulate. Usually in these one sided hidings one team is just atrocious – not on that day. Two modern day “classics” – the Dublin-Kerry SF in ’13 and the drawn SF between Kerry & Mayo this year – are represented. Sometimes the stats do back up what the eye sees. I’m still flummoxed how Kerry could be involved in those games and then produce what they did in this year’s final! No need to elaborate really. We have seen from above that Roscommon & London produced stinkers but here it shows that Mayo didn’t shoot the lights out to rescue the game. Given their lofty status in the top five games they were basically brought down by the paucity of the opposition. The Dublin Wexford game was just atrocious – both teams were as bad as each other ranking 120th and 144th on the overall list. Ha. So four of the top seven games in terms of shots attempted from deadballs involve Meath. I was going to make a joke about the spirit of Mick Lyons living on but in two of those games Michael Newman had 11 attempts – showing that Meath were as much sinned against as sinner. Newman is the only player to have 11 attempts in a game (Brian Farrell & Cillian O’Connor managed 10) so it is likely that the high Meath counts are more an indication of Meath’s confidence in Newman’s distance than anything else. And so we come to the yearly comparison piece whereby this year’s performances, numbers wise, are stacked up against preceding years. In previous versions of weightings 2010 data had been used, in conjunction with 2012 & 2013, so as to create more volume (and as the reasoning goes more accuracy). From here on all 2010 data will be omitted. There is no great reason for this, as the averages more or less stack up, but it just feels more complete to have continuous year’s returns rather than an outlier with a year’s hiatus in between. At this juncture, after taking a year out in 2011, there is no guarantee that the 2010 methodology was the same as is used now. 2010 was the first year of doing the tracking – I’m pretty sure issues were being ironed out throughout that year so 2012 data onwards just feels more robust. Essentially Shot & Success Rates for 2014 stayed very close to 2012 & 2013 levels – once teams had the ball inside the opposition’s 45 the ultimate overall ratio of shots & scores from those possessions stayed the same. The difference comes in the volume of attacks. There was a 9.7% increase per team in attacks on the 2013 returns. This is quite significant. Of course if the volume of shots and accuracy of shooting is constant on an increased volume of attacks you will get more scores; and that’s what happened with an increase of 1.6 scores per team per game. So why have the volume of attacks increased so dramatically? Many put the increase squarely at the feet of the black card. It has undoubtedly had an affect but I’m a firm believer that this is a copycat game and Dublin’s successful swashbuckling style throughout 2013 & 2014 will also have had an impact on how team’s approach the game. Although smaller there was an increase of 2.9% without the black card in 2013. If it was all the black card I would expect that what happened inside the 45 would be as affected by what happened outside. Players would have more time/space to shoot – less people pulling at their arm/jersey. The numbers don’t bear this out however. Yes the black card allowed for less attacks to be stopped by illegal defending up front but there was no boon to the shooters. Another area where the black card has been given credit is the reduction in the volume of frees. Yes there was a decrease in the volume of deadballs per game in 2014 but this decrease was only back to 2012 levels. Is this decrease then the black card affect or simple variance? I am not for one moment saying the black card is a bad idea. Or that it has had no effect. I would argue that there are many variables that lead to a shift in trends of which the black card is one. And trying to quantify the value of that one variable is incredibly difficult. So what of shooting from play? Essentially there was no change in the accuracy; it came in bang on the 2012/13 average. • The Success Rate for point taking in 2014 was more or less the same as 2013 – 44.8% versus 44.7%. Some of the deficiencies in the weighting were outlined earlier in the year (here) – especially when it came to less frequent events like penalties, attempts from sideline balls and goal shots that go for a point. Due to a lack of data, both in terms of not capturing data in 2010 and events occurring infrequently, some subjective judgement had been applied to the weighting in these cases. Although the rationale behind the judgement calls made sense (to me at least!) it is something I’ve always wanted to remove. With three consecutive years’ worth of data, where the same methodology has been consistently applied, that is now possible. That is not to say the new weighting is complete – there are still some very small volumes on penalties, sideline balls etc. but it is better to just take the numbers and deal with any issues that arise thereafter rather than try to overlay a subjective value. The weightings have not moved all that much with the main differences coming around goal attempts. Previously if a player went for goal and got a point he got the same weighting as if he’d scored the goal. This was slightly absurd so now in that instance a player will get the same weighting as if he’d gone for a point. Probably not ideal (he should get some extra bump for going for goal) but I think it’s better (or less bad!) this way. Similarly a player got the same weighting for scoring a goal from a penalty as from open play. Given that penalties are converted at 82% this over sold a converted penalty. The weighting now reflects this conversion rate. In the coming days I will overlay this new weighting on all games from 2012 onwards and see what shakes loose. When compiling the accuracy charts from play it became apparent that James O’Donoghue’s point taking accuracy was freakishly good. But how exactly did he achieve such a high Success Rate? These are a remarkable set of numbers. Up until the semi final replay this year O’Donoghue had not missed an attempt at a point from inside the 20m line in nigh on three years. Not one. Even after that game he is running at an astonishing 90% Success Rate for all shots inside the 20m line. A very high percentage of O’Donoghue’s point attempts come from Sector8; 30% versus an average of 13%. This is the most productive area, and an argument could be made that this would inflate your Success Rate but this is not always the case – as we have seen with B Brogan. Plus O’Donoghue is converting those “simpler” chances at a much higher rate than the average. 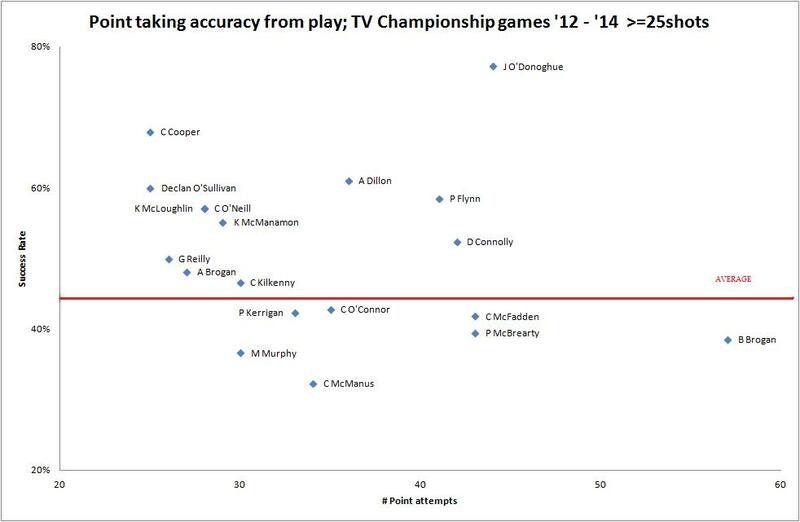 It is not just in Sector8 that O’Donoghue shows above average levels of accuracy – it is all across the pitch. For point attempts out wide inside the 20m line the average return is c44% – O’Donoghue has converted all seven of his attempts. It continues outside the 20m line. O’Donoghue rarely shoots from the right wing (Sector4), only taking four shots over the three year period (possibly a point to note for opposing defences!) but when he does shoot from his favoured sectors (5 & 6) he converts at a combined 70%. The average? 44%.